A fun and joyful birthday card, perfect for your dear nephew! This birthday balloon card will make your nephew's birthday even more fun. Blue and white balloons to match the party and a sweet message to convey your feelings. Get him this chic birthday card today and make your nephew's day perfect! Bunches of colorful balloons float through the air, a wonderful way to put your nephew in the mood for a celebration "full of laughter and special wishes" from the people who care about him, like you! He's sure to get carried away in the festivities and look ahead to next year with happiness. It doesn't get any bigger than this! 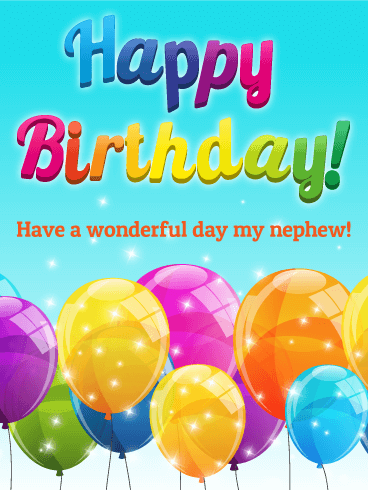 Send this big balloon birthday card to a cool nephew. It's funky and fun and great for a boy. 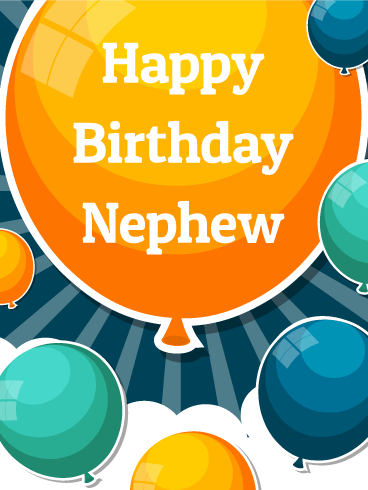 Your nephew's birthday is a special day, so why not send him a fun birthday message and add to the celebration? These party balloons float high in the clouds ready to wish your nephew the best birthday ever! This will get his attention! Orange and blue are a bold combination and your nephew is bold kinda-guy! Send him this simple and fun birthday message. 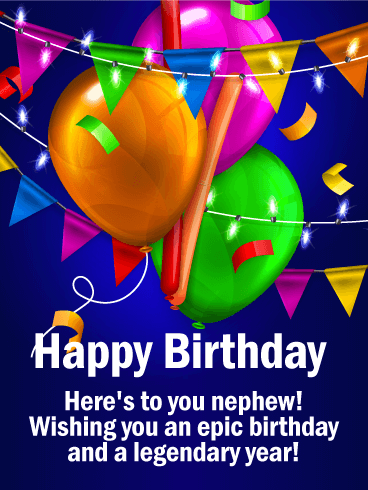 Wish your nephew a great year on his birthday with a cool card straight to his inbox. Let your nephew know he isn't forgotten! 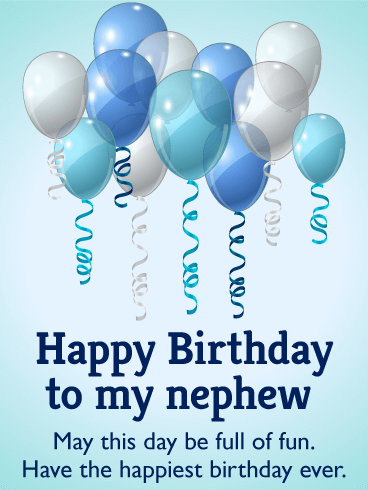 Celebrate his special day with a cool birthday card sporting a bunch of shiny blue balloons. Struggling to find a great birthday card for your nephew? Look no further! This purple and gold birthday greeting is simply festive and truly thoughtful. Wish him a day filled with lots of smile and laughter-he deserves it! 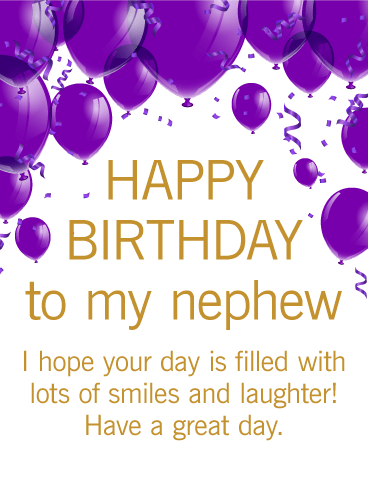 A birthday is the perfect time to celebrate your dear nephew and remind him of how special he is to you. Rainbows are so popular right now! Don't let your nephew miss out on all the fun! 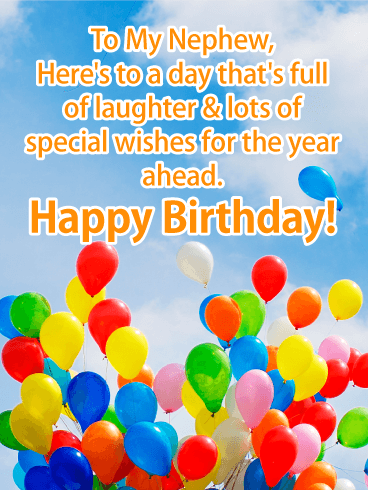 Send him this awesome birthday card full of colorful balloons that sparkle and shine. This birthday card is one of the best for boys with big imaginations and hearts full of wonder. This rainbow birthday card is a blast. 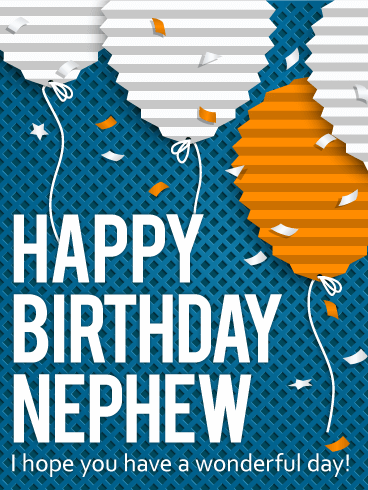 Send it now and make your nephew's special day even more wonderful. 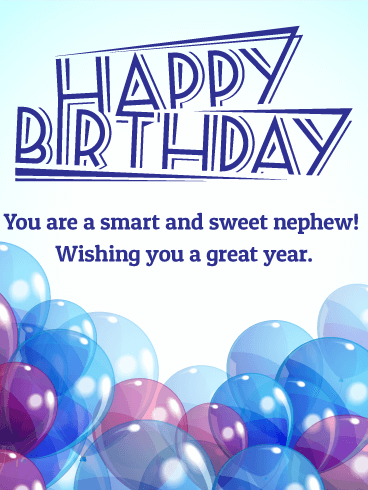 For a smart and sweet nephew, send this great birthday card. Nephews are really special and wonderful gifts to our lives. 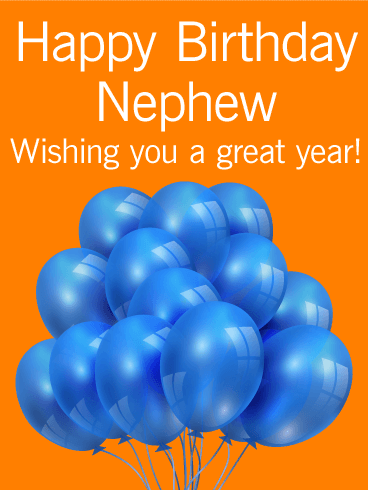 Let your nephew know you love him and are wishing him a great year ahead. Take some time to send kind thoughts and a happy birthday message to him on his special day. This birthday card is full of beautiful, translucent balloons and a hip and sharp birthday font. It's a special birthday card for a special birthday nephew. An elegant, crafted birthday card made with a splash of color, perfect for your dear nephew's wonderful birthday! Balloons, confetti, and a loving message will add even more cheer to his special celebration. Offer this birthday card to your nephew today and he will love you for it!